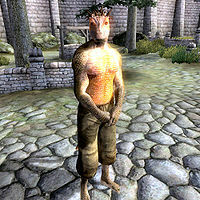 Deeh the Scalawag is an Argonian commoner living in Leyawiin, where he tries to get by as a beggar. His bedroll and food bag are located northeast of the west entrance, near the well. He is infected with the yellow tick disease and has a chance to infect you should you fight him. He lives the typical beggar life, starting his day at 6am and wandering around the west gate of the city during four hours. At 10am he will move to a more suitable place in front of the Chapel of Zenithar, where he will beg for money and food until 2pm. At that time he will move again, this time near the northeast gate of the city. At 6pm he will head back to his bedroll to grab a piece of food and have dinner for two hours; if his sack is empty he will walk around until his bedtime. After having his only meal of the day, he will stroll around near the gate until his bedtime at 10pm. During rainy days, he will instead be located under the tree in front of the Leyawiin Mages Guild, taking cover until the rain ceases. His only possession are some sack cloth pants and any amount of money that he earned during the day. He, along with the other beggars in Cyrodiil, will give the clue to find the Thieves Guild and will also inform you about the Countess' secret during the Ahdarji's Heirloom quest. Also, like other beggars, speaking with him is necessary to complete the Speechcraft Training quest.